That F'ing Monkey: Happy Shark Week! Shark Week is back!! Actually it starts 9 am Sunday morning with Prowling Sharks in the Mediterranean. It is probably the most boring of all the Discovery Shark Programs. I know I have fallen asleep to it at least twice. But that is okay, because I love Shark Week. In fact, now that Discovery has started it in August in stead of July, I consider it as their week long birthday present to me, my birthday will fall on the last day of Shark Week this year. Apparently Craig Ferguson will be hosting this year. Not someone I usually associate with the Discovery channel, but I like him anyway so I won’t mind it. I found a few of this year's new shows, so I can give you some information on what is coming up. Ultimate Air Jaws, another show about great white sharks jumping from the water. It is made from the same guys that made Air Jaws and Air Jaws 2. I'm sure it will be stunning. Apparently better HD cameras are used this time around. I hate to say it, but Discovery has lost the great white race to NatGeo, you can't beat Expedition Great White. Into the Shark Bite sounds like they are having sharks bite onto cameras. Sounds a bit strange really, but I’m game. Shark Attack Survival Guide. Tips for fending off sharks in different scenarios? I know that along with the shark attack type shows it just builds on the sharks bad reputation but I love watching this stuff. Which leads us to Day of the Shark 3 and Shark Bite Beach. You know the drill on these shows. Talk about the attacks, talk to the witnesses, and talk to the survivors. It can be interesting stuff though, like the lady who was thrown on the back of the shark and pretty much surfed on it. The last new show Discovery has listed on their site is Shark Bites: Adventures in Shark Week. Craig Ferguson interacting with sharks and then clips from other shark shows. Since I already said I like Ferguson I’m interested in seeing this one. And that only takes us up to Wednesday! Hopefully there will be a few more new shows, but if there are I can’t find them on Discovery’s website. 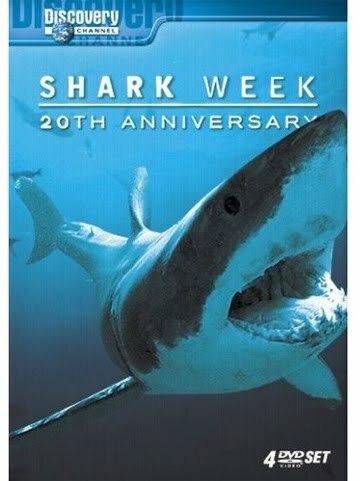 Doesn’t matter really, cause I’ll still be happy re-watching things like Deadly Stripes, American Shark, and 10 Deadliest Sharks. Maybe I’ll even re-watch Anatomy of a Shark Bite. So happy Shark Week everyone!! I remember getting really excited about Shark Week as a kid. Good stuff.